Some of the best things in life are challenging, there’s no doubt, and you don’t often realise their brilliance until it’s almost too late. Now, Trout Mask Replica may well be one of those things. 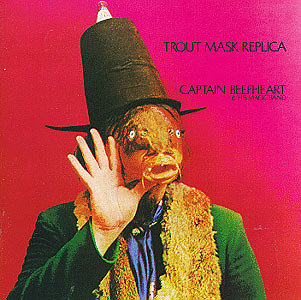 Don’t get me wrong here, Trout Mask… is not a music album you would find in many music fan’s top 50 albums of all time. Well, not your average fan at any rate. It was recorded by the recently deceased Captain Beefheart (not his real name, funnily enough) and his so called “Magic band”. This experimental opus, released in 1969, was a fusion of delta blues, free style Jazz, avant-garde strangeness and general out of tune clarinets and sax, brain rattling repitition and plenty of enthusiastic banging. The whole album sounds like a bunch of stoned freaks broke into your garage with lots of random instruments (which they’d forgotten how to play), and decided to record an album. Which it kind of is. Its brilliance lies in its unashamed exuberance. It’s not a joke. The Magic Band really meant it. It has tracks which border on all out lunacy and have you wondering what the hell they were all on (shouts of “Fast and bulbous!” are sure to get your neighbours interested, in the wrong way). But hey, one man’s lunacy is another’s psychological mecca. Even the album cover art gives the casual viewer cause for concern. The guy on the cover has a fish’s face. Not normal, that. By all accounts, the photo shoot was a very unpleasant experience, as that trout wasn’t a particularly new trout (and from what I’ve heard, they smell pretty bad as soon as you take ’em out of the water). A small price to pay for art I suppose. Don Glen Vliet (for that was Beefheart’s real name) passed away just over a month ago, in his native California, and it’s solely because of this weird and wonderful double album of experimental noise that I can honestly say that I’ll mourn his passing. Both him, his band and this album have been on my mind today because last night I had to explain to my Dad who Beefheart was. He’d read some obituary some weeks back and had ended up reading about the guy’s life (and his friendship with the late Frank Zappa). My Dad’s experience of the ’60s is very much one of the generation gap- he was the wrong side of thirty when this racket came out, and didn’t have a cat in hell’s chance of hearing it. He might have got to hear Engelbert Humperdinck’s latest at the time, though, if you see what I’m saying. Still, Mr. Vliet can rest easy in his grave knowing that in the end even my Dad got to know who he was. Pity he had to die first, but that’s show business for you. However, I’m not quite ready to play my Dad ANY of Trout Mask Replica yet. He thinks I’m quite weird enough as it is.